The UK Higher Education Learning Space Toolkit was launched in 2016 to help staff from different professional services share best practice and work more effectively when creating learning spaces. It is intended as a practical guide and a source of inspiration in the design of spaces that delight and motivate students, as well as meeting their functional needs. This series of case studies complements the original toolkit and illustrates how a range of different institutions have applied the good practice in their own distinctive ways. This is not an exclusive list of projects but presents a series of examples of the variety of effective learning spaces projects being delivered across the UK. It is hoped this will be extended over time as more institutions evaluate the learning spaces projects they deliver. The case studies were created using: a questionnaire to project champions, stakeholders and users; focused interviews with key stakeholders; talking heads videos; observation of space in use and existing post occupancy information. "Students should be at the heart of every project and although students are ephemeral by the very nature of study cycles, the student body is the constant." The case studies themselves are a valuable source of inspiration and lessons learned for the sector. More than that, the approach we have taken provides you with a model you can use to evaluate your existing learning spaces and to approach new developments. The format of each case study follows the chapter headings of the toolkit. We advocate a holistic approach that views entire campuses as learning spaces and considers the seamless flow of different types of learning activity as well as the overall range of provision. Professionals leading learning space projects need to work with a range of stakeholders across functional areas that are outside their day-to-day experience. The Toolkit emphasises the importance of participatory approaches to stakeholder engagement from the beginning if you are to avoid costly mistakes and we suggest some techniques for gaining effective stakeholder participation. Learning space projects can be complex and challenging even for experienced project managers. You will be dealing with the 'hard' aspects of the physical build as well as the 'soft' aspects of a change initiative. The toolkit discusses the particular life cycle of a learning space project and provides some guidance, templates and checklists. 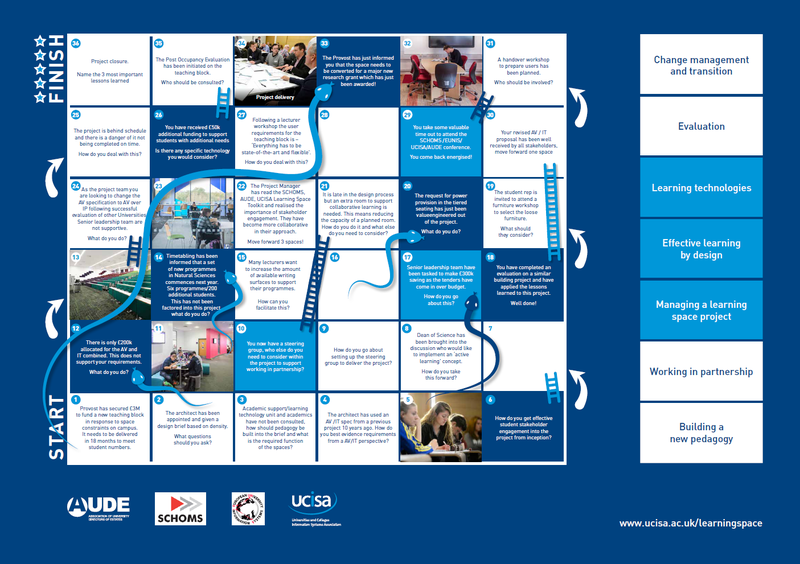 For a fun way to understand some of the challenges you can face in a learning space project try our snakes and ladders game. Download a pdf copy of the game. By taking a holistic view of these topics at an early stage you can avoid management and usability issues further down the line. The continued importance of physical learning spaces lies in supporting learning activities that are best undertaken collectively or which have a compelling reason for bringing students on campus and technology has an important role to play in this. Our toolkit takes a broad look at digital technologies and other equipment used in learning spaces. Learning space projects are often significant investments and you need to know that they are delivering the intended benefits. Typical post-occupancy evaluation of a building focuses on technical and functional performance. The toolkit goes further than this and provides guidance on designing evaluations that measure whether the space is actually enhancing learning. Download the questions we asked our focus groups in preparing the case studies (Word docx). Creating new types of learning space often demands a major exercise in change management to ensure that both staff and students are able to make effective use of the space. A space designed to support a particular pedagogic approach, such as active learning, will only be effective if the curriculum and individual lesson plans are also designed with this in mind. Our toolkit looks at a range of strategies for managing change and easing transition to new practices. For more on each of the topics mentioned here see the UK Higher Education Learning Space Toolkit.